It has been very quiet for us since our last posting but activity is picking up! In November we moved WORKNOT to Ensenada Mexico. Returning to Cruiseport Marina, just a short walk from downtown was a treat. The same crew of folks run the marina including Jonathan and Enrique. Both young men have been very helpful to us in past visits. There is an active cruisers community in Ensenada which includes a daily VHF radio net for cruisers and others to check in and coordinate support for medical, transportation, project assistance and most importantly social gatherings. We met a number of interesting people and renewed some old acquaintances. We are all characters of some type and the crew of WORKNOT is no exception. Likely in some other blog there is a captain writing about "those people we met on the Nordhavn.....". Memorable folks we enjoyed being with in Ensenada included a lady living on a 87' Trumpy motor yacht built in about 1942. It is MASSIVE and includes a direct start diesel engine and an open grate from the galley to the engine room. The wooden timbers used in the construction are simply works of art, many of them 8" thick or more. Kick Back, Originally Elsie Fenimore, built for E.R Fenimore Johnson, son of ER. Johnson the inventor of the Victrola, 1942, renamed USS John M. Howard (IX-75). She is an 87’ Trumpy Motor Sailor Yacht with 4 large staterooms, 2 heads, 1 with Jacuzzi tub, and work shop. She has a 60 HP Superior engine and is water tight. Her upper deck is 2” thick teak, and she is covered in exquisite brass pieces. 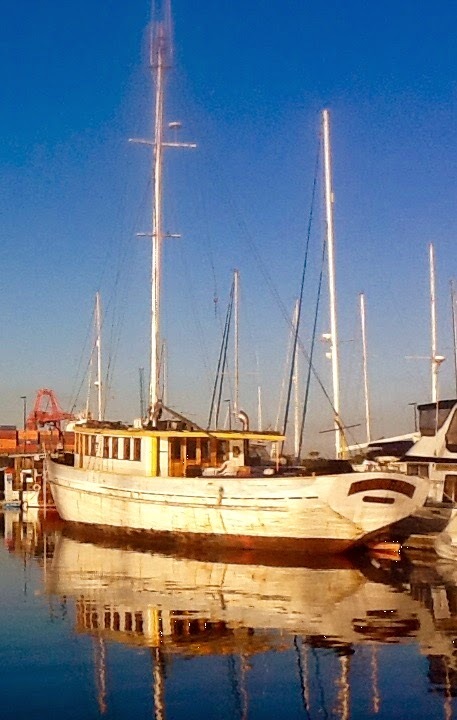 She has fresh paint topside and is in great condition. Built with heavy construction pine she will last another lifetime. Life's problems don't go away just because your on your boat in Mexico but perhaps they become a little easier to manage. One couple was dealing with the wife's cancer re-occurance, another couple managing to stay on the boat and deal with Alzheimer's, world cruisers who have decided to swallow the anchor and sell their trawler after converting from sail to trawler in an effort to extend their cruising time and so on. Mary and I are both thankful she has recovered from the ordeal in Turtle Bay and health for both of us is not an issue today. A very talented welder supporting Rob preparing the keel plate for Ocean Villa. Christmas in Mexico is always fun, its as big or bigger of a holiday season there as the US. Lots and lots of decorations, holiday meals and family gatherings. My sister Peggy met us in Las Vegas and traveled to Ensenada with us for her first Mexican visit. A bit apprehensive to visit Mexico she left her home in Kentucky and trusted little brother to keep her safe and return her in one piece. I asked her as we crossed the border southbound if she would ever consider living in Mexico or at least extended visits. A resounding NO was the reply. After a week of fabulous weather and even better Mexican hospitality and food asked her the same as we crossed the border northbound. Not surprisingly she had a major change of heart and expect her to be back to visit Mexico as soon as we return. For the first time in a long time we had a car while in Ensenada. This allowed us ready access to Costco, Walmart, Home Depot and other US big box stores. Also expanded our list of bakeries, restaurants and boat parts stores we got to know. Because I have a small consulting gig in San Diego frequent trips there provided plenty of opportunity to bring back any comfort foods and boat parts we were missing. Driving in the states will require some adjustment as in, Nevada actually expects you to STOP at a stop sign rather than roll through slowly. On the other hand pedestrians have the right of way in Mexico and drivers pay attention to them. Crossing a busy street is much easier and safer than in the US. Next up a road trip on the Baja peninsula and WORKNOT goes on the hard for a paint job.